When my granddaughters are sick—my life gets busier. Nothing seriously wrong—just the normal cold and congestion that plagues children and mothers—Monday was the doctors visit, and Daughter one was the sickest. She is now on the mend, but sisters 2 and 3 are under the weather. By yesterday my daughter needed some relief—Sick children often result in an overflowing of bodily fluids (from one end or the other)--Laundry (always a chore with 3 little ones) had grown to monumental proportions with what was really just a little cold and fever—nothing to worry about—but sick kids do make messes. 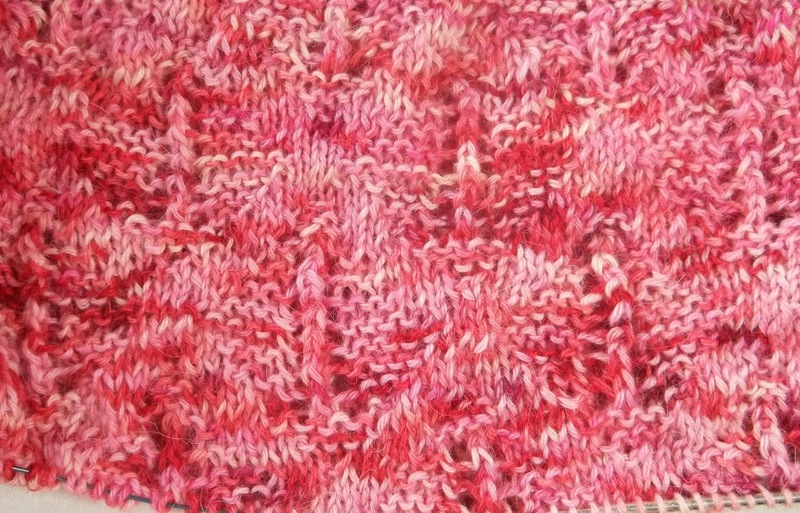 My Pretty in Pink sweater now has 1.5 repeats of the pattern completed + 2 more rows... Each row makes the over all (stitch) pattern clearer—and makes me happier with my choice of this stitch pattern. I like how the lacy ladder at the center of the stitch pattern make a strong vertical statement that contrasts nicely with the horizontal nature of the garter stitch. The pattern is simple enough that I learned it before I finished the first repeat. My secret project is coming along nicely too. Part A (2 pieces) are done and blocked, Part B (1 larger piece) is 1/3rd done. And its a little harder—since it involves working the stitch pattern in reverse, because I wanted to have the pattern balanced—starting at the center and working outward. It is a small detail—one of those persnickety details I tend to like. Part B is larger than the 2 pieces of Part A put together—so working half in reverse does slow me down a little. And, there is always just the normal household stuff to do—I still haven't put away all of my holiday decorations. The displays have been disassembled and packed up, but not put away. And they have gotten me thinking about some changes I want to make. I haven't changed my basic layout of either my living room or bedroom since I settled on them 15 years ago when I moved here. I don't think there are major changes in the making...but I am thinking its time for some changes. My sofa is an Ikea model—I am thinking about changing the slip cover—a change of color to a major piece like the sofa will really change things up! Today, I want to get some sewing done—and my own laundry done too. I'll sneak some knitting it, too! Or at least I hope so.. I am not feeling too well myself right now. Each and every day. The pattern (aside from the lacy ladder) is still hard to see, I really think blocking will help. Still one aspect of the pattern (and repeat) is clear-- the lacy ladder (which is surrounded by a garter stitch diamond--which is harder to see) this image has a filter to make the pattern clearer (it changes the color) The over all design is clearer with each row. A relatively large vertical pattern. This yarn (Atacama by Araucanie Yarns) is imported from Chile, and is 100% alpaca, 'kettle dyed'--This kind of dying doesn't always have an even color (intentionally) It is not an even “space dye” but intentionally mottled. I bought the yarn when it was on sale (a clearance sale, as the store was discontinuing carrying the yarn.) It is light--(DK weight) and very soft...But alpaca is very warm. This is my “at home project” since I think it is too big and bulky to carry around with me. I also have a small portable project –but lately that has been an at home project too—Now that I have a car, I don't spend as much time on buses or the subway—and my portable projects knitting time has been cut. I actually have a few portable projects –a group of UFO's—a pair of socks, (for me) a pair of socks (for my SIL—but I haven't even cast on yet) a pair of fingerless gloves, (for me, too) Plus a semi secret project—for the spring/summer. I have a queue of 20 projects –The Pretty in Pink sweater is on the queue—but the fingerless gloves and the semi secret project aren't! I guess I should review my queue! Done yet.. But still making progress. And doing some mental math. I know from experience, I like my sweaters to be at least 24 to 25 inches long, measured from center back.. I always make some short rows in the back to make the back longer than the front, too, so the sweater doesn't ride up in the back. So, the back yoke is about 10.5 inches—9.5 of actual knitting, 1 inch “space”. I want to finish about 14 to 15 inches of body. And I want about 1 inch of garter at the hem. So I need about 14 inches of pattern body. Right now, I have 28 rows of a 32 pattern row pattern done..(not quite yet a full repeat.) These rows have equal just under 4 inches—the full repeat of 32 rows will be about 4.3 inches—so if I need 14/15 inches, I need, 3 full repeats, (13 inches) to make the body...The result will be ,a bit short of my preferred length- but it will be a bit longer when another inch of garter stitch is added for a hem. I find I have pain after 4 rows (even with the compression gloves) so I have been limiting my self to 2 rows at a time, twice a day—so I need 4 rows to complete repeat 1, + 64 to complete the second and third repeat, an inch garter stitch for the hem, will be another 10 rows. Of course there will be still more time needed for the sleeves—so another month to finish. I won't have many opportunities to wear it much this winter. Maybe a week or two in February, or of there is a sudden cold snap in March. But a big chunk of yarn will have been moved from stash to FO pile. 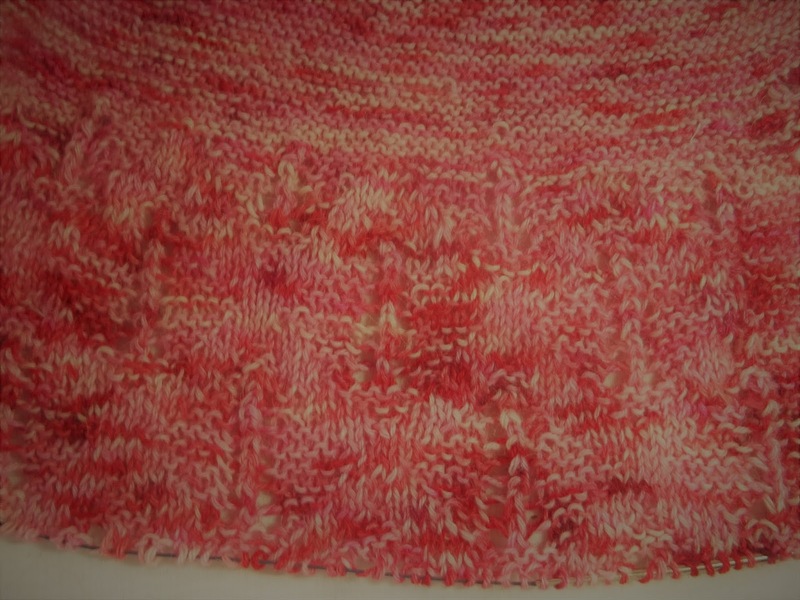 I also plan to make an matching sleeveless shell, in a solid pink (Lion Brand Sock Yarn)--The shell will be loose fitting, and worked in the same lacy pattern as the body of the Pretty in Pink sweater Itcan (and will) be worn with a camisole as a shell, and other times as a vest with blouse or T shirt type top. And occasionally, both pieces will be worn together as a sweater set. One half of the set will be wool, the other half will be alpaca, --one half in a solid smooth pink, the other half in the kettle dyed variegated yarn—not a totally matchy-match set—but a set of sorts. The shell will be another months work. Well that is the plan—But plans don't always work out. 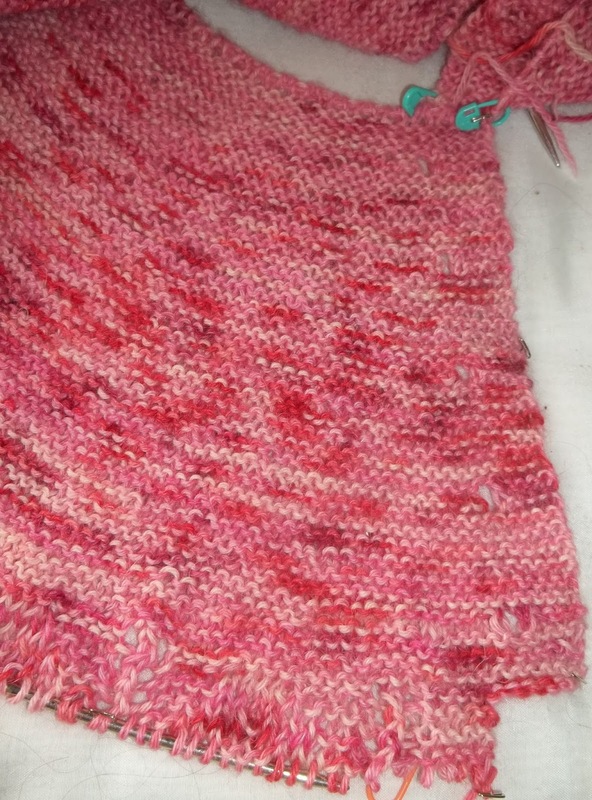 In between, the 2 long rows of the sweater, I am working on some decorative edging for a summer project—the stitch count varies, from 8, to 16, to 12 stitches in a 18 row pattern-- in the past two weeks I have logged 25 repeats--(I will need, eventually 75 repeats in all. So that little project is about 1/3rd done. 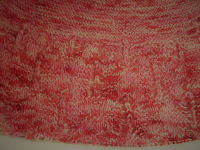 Well the knitting part is about 1/3rd done—there is more involved that just knitting. And I plan to make at least 3 sets of this project... Each will take a month in all (March, April, May!) A simple (but secret for now!) bit of luxurious knitting. As always, my queue and plans are ambitious—and I will have to pace myself to be able to get them all done—There are sock projects planned, (including a pair of pink socks to match the Lion Brand pink shell) and sweaters for the twin granddaughter planned, and sewing projects, and repainting my bedroom, and.... Well for now, 4 long rows a day is all I am committing to! Secondly, I ended up with a pinched nerve in my neck that sent waves of pain down my left shoulder and arm. This hasn't passed—but I have been working on it, too. First I am careful how I move (and more importantly, how I position myself as I sleep) and I have been working on range of motion exercisers—These have worked, and while not yet pain free, everyday, is better and better. Meanwhile, in an ongoing project, I have (finally!) gotten my bathroom painted. All the old accessories, (shelves, and storage stuff) have been cleaned—but not all of them have been returned to the bathroom (or replaced yet.) All of these things were acquired piecemeal, or as impulse purchases, or as recycled stuff—and I am not putting in holes to mount these. Some are going to be re-used, some recycled—and some new ones will be purchased—but I haven't decides which or what, right now, I haven't found the “right stuff” for replacements, so the redecorating isn't complete. The bathroom looks better already with the painted completed, a new cotton pique shower curtain, and a replacement towel rod was found and installed. Small changes, but significant. More to come! 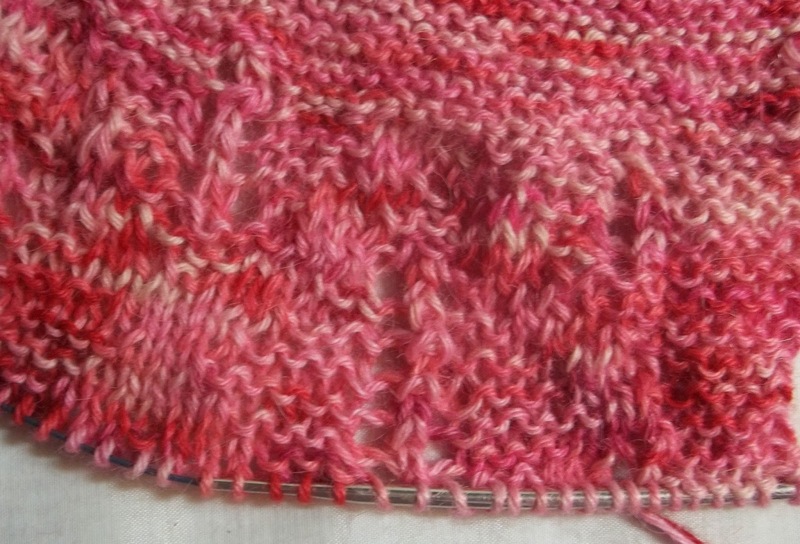 So, now that I am feeling better, I am getting back to working on my pink alpaca cardigan sweater. It's a top down seamless one, with no real pattern, just a plan. The plan is: seamless circular yoke—in garter, that features a button band, (and 5 buttons) Below the armholes, a lozenge shaped garter and lace pattern—I will knit the body of the sweater first, and then make the sleeve until I run out of yarn—I'd like long sleeves—but I won't be upset if I only have enough yarn for ¾ length sleeves. So far there are only 8 rows of the 32 that make up the pattern on the body of the sweater, --so you'll have to wait a bit to see how the pattern works out. 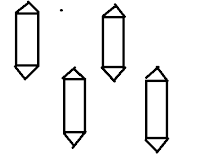 But here is a idea of what I mean by lozenge shaped—a double pointed arrow sort of shape. 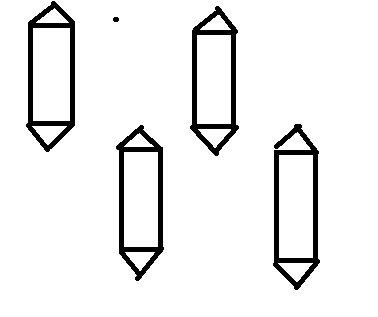 The lozenge will be staggered/off-set as they are in the image, too. So lots of little bits of progress—Nothing yet completed... just a little progress here, and there and everywhere.